Daniel Musek did his first steps towards becoming a master violin maker at the age of 15, when he started to work with master violin maker Vilim Demšar in his workshop in Ljubljana. There he spent six years intensively working and studying the art of making string instruments. Afterwards he decided to go to Cremona, Italy, to join the famous Istituto Professionale Internazionale Artigianato Liutario e del Legno 'Antonio Stradivari' to further his skills and understanding of the art and craft of violin making. In Cremona he studied in the class of maestro V. Bissolotti and did courses with some of the most important violin makers and restorers in Italy, like B. Carlson, E. Blot, C. Amighetti, A. Brugnini & E. Beck, and master bow maker E. Slaviero, to name a few. After graduation in the year 2000, he spent two additional years in Cremona, dedicating his time to acoustic experiments and deeper understanding of the origins of the violin and other string instruments. Daniel then decided to return to his native Slovenia where he established his own workshop. He now lives and works in the medieval town of Škofja Loka. His violins soon found the way into the hands of interested performers. His instruments are played by many great musicians all over the world. Daniel plays violin, viola and classical guitar, and has some basic knowledge of cello playing. He speaks fluently Slovene, English, Italian, Croatian, Serbian and some German. 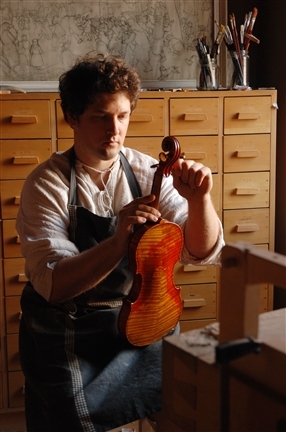 Find out more about Daniel Musek and the art of violin making in this 50-minute documentary.